Monday’s open letter from 47 GOP senators marked an unusually public and aggressive attempt to undermine Obama and five world powers as negotiators try to strike an initial deal by the end of March to limit Iran’s nuclear programs. Republicans say a deal would be insufficient and unenforceable, and they have made a series of proposals to undercut or block it — from requiring Senate say-so on any agreement to ordering new penalty sanctions against Iran or even making a pre-emptive declaration of war. 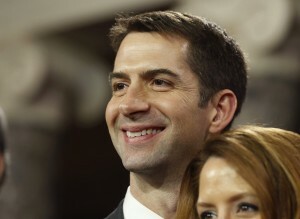 The letter was written by freshman Sen. Tom Cotton of Arkansas, who opposes negotiations with Iran. It’s addressed to the “Leaders of the Islamic Republic of Iran” and presents itself as a constitutional primer to the government of an American adversary. Senate Majority Leader Mitch McConnell of Kentucky’s signature is on it, as are those of several prospective presidential candidates. Iranian Foreign Minister Mohammed Javad Zarif responded via state media, dismissing the letter as a “propaganda ploy” and noting that many international deals are “mere executive agreements.” He suggested the senators were undermining not only the prospective deal with Iran but other international agreements as well. With Cotton presiding over the Senate on Monday, Democratic leader Harry Reid spoke out, saying Republicans were driven by animosity toward Obama and unwilling to recognize that American voters had twice elected him president. “Let’s be very clear: Republicans are undermining our commander-in-chief while empowering the ayatollahs,” Reid said. “Republicans don’t know how to do anything other than juvenile political attacks against the president,” the 75-year-old Reid said with the 37-year-old Cotton listening. The Republicans’ move to stop a nuclear deal with Iran comes just days after Israeli Prime Minister Benjamin Netanyahu spoke to a joint meeting of Congress at Republican House Speaker John Boehner’s invitation. In his address, Netanyahu bluntly warned the United States that a deal would pave Iran’s path to a nuclear bomb. The White House denounced Cotton’s letter, saying it was part of an ongoing partisan strategy to undermine the president’s ability to conduct foreign policy. Vice President Joe Biden released a statement saying, “In thirty-six years in the United States Senate, I cannot recall another instance in which senators wrote directly to advise another country — much less a longtime foreign adversary — that the president does not have the constitutional authority to reach a meaningful understanding with them. Not all Republican senators are united. One significant signature missing from Monday’s letter was Bob Corker of Tennessee, the Senate Foreign Relations Committee chairman. Action on any new legislation challenging the administration’s strategy would be likely to begin with him. Still, even if all parties to the international talks reject the letter as a stunt, the mounting opposition to an accord could have repercussions. Negotiating alongside the U.S. are Britain, China, France, Germany and Russia. The Obama administration believes it has authority to lift most trade, oil and financial sanctions that would be pertinent to the nuclear deal in exchange for an Iranian promise to limit its nuclear programs. For the rest, it needs Congress’ approval. And lawmakers could approve new Iran sanctions to complicate matters. Nuclear negotiations resume next week in Switzerland. Officials say the parties have been speaking about a multi-step agreement that would freeze Iran’s uranium enrichment program for at least a decade before gradually lifting restrictions. Sanctions relief would similarly be phased in. Iran says its program is solely for peaceful energy and medical research purposes. The deadline for the whole agreement is July. In the letter, Cotton and his colleagues stressed that presidents may serve only eight years while senators can remain in office for decades. The implication was that without Congress’ blessing, the deal could fall apart when Obama’s successor is sworn in in January 2017. The deal taking shape is not a treaty. Under international law, the provisions of treaties are far more binding than other agreements. But by themselves, congressional Republicans won’t be able to block an international agreement. McConnell has spoken of action later this month authorizing Congress to take a yes-or-no vote on a deal. But that vote would be symbolic. Associated Press writers Alan Fram, Steve Peoples and Jim Kuhnhenn in Washington and Cara Anna at the United Nations contributed to this report.